Mark Ross says, “Thank You Tennessee State Bank for continuing to be a supporter of our organization! 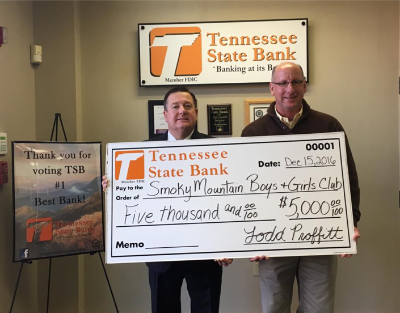 Tennessee State Bank's annual contribution helps us serve more youth in Sevier County! Bank employees also volunteer their time during the year to teach members about being financially responsible. Thank You Tennessee Bank for all you do for us”!! Let us help you with all your needs. Learn More about Convenience Services.